Raphael is the archangel of the fifth Ray, a ray of truth, Integrity, healing, science, deposition, abundant life, music, and mathematics. His divine counterpart is Maria, embodied Maria, the mother of Jesus. Their ray corresponds to the chakra of the third eye; They can also help us gain spiritual vision and the gift of discerning spirits. The name "Raphael" means "God has healed" or "The Cure of God." In one Hebrew text it is said that Raphael opened up the healing power of the plants; The other text tells how he healed the blind and tied the demon. Catholics revered him as an angel of the Lord who healed the sick in the pool of Bethesda. The Book of Enoch states that the duties of the Archangel Raphael were to heal the sick and wounded. According to the Hebrews, Raphael was one of the three archangels that appeared before Abraham. They also believe that it was Raphael that gave Sarah the power to give birth to a child at her old age. Raphael is also known as the patron of travelers. In the book of Tobit, Raphael, introducing himself as a knowledgeable road traveler, accompanies the son of Tobit, serving as a guide on his long journey. At the end of the story, Raphael reveals the truth about himself and explains that God sent him to test the faith of Tobit and his son. They have passed their trials and received great blessings of healing and abundance. Raphael’s abode is located in the ether kingdom over Portugal. The flame of healing, burning on the altar of his divine abode, was physically entrenched when, in 1917, Mother Mary appeared to children in Fatima. Even to this day a ray of light shines bright upon this place, like a powerful waterfall from the ethers to physical reality, healing all whom that way shall come. Maria and Raphael assist all medical institutions around the world. On an etheric levels they teach future parents of Christ Consciousness. They inspire scientists, healers and health professionals to create new medicines and alternative therapies. Angels from the Archangel Raphael’s team are master surgeons. Raphael says that they use "laser technology" to "penetrate into the very core of the cell, in order to extend the purple flame from inside the cell and seal it with healing thoughtform." Archangel Raphael gave us a healing thought form, which is a scientific formula for the restoration of inner blueprint and divine integrity when it (Thoughtform) visualizes the surrounding and cross cells and atoms of the four lower bodies (or Specific body). Thoughtform consists of three concentric areas of sacred fire, the white sphere surrounded by sapphire-blue, which in turn is placed in emerald green. The white sphere in the centre works on the local level, repairing the damaged part or sick body to its original state of perfection. The next, the blue sphere, establishes the protection and action of God's will. The green outer sphere restores the flow of the spirit through matter and integrity. If you or your loved one suffer from the injury, call the healing Thoughtform: "In the name of Jesus Christ, the beloved Archangel Raphael, Blessed Mother Mary, place her healing thoughtform over (name of man)." 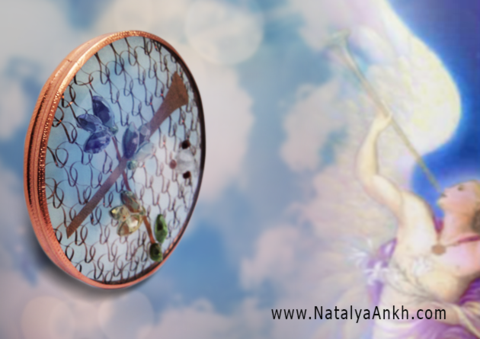 Archangel Raphael has appeared to me and asked that I channel through and manifest into physical reality a healing disc that would assist others in healing their energy fields, opening the heart chakra and connecting them to the divine. Emerald was worshiped by ancient Incas and Chaldeans. Phoenicians devoted it to Ishtar goddess of fertility and love. It was revered in all the major religions for spiritual strength and beauty. In Ancient Egypt, it was considered a symbol of eternal life, the gift of Toth, God of wisdom and was a beloved jewel of the Queen Cleopatra. What makes this mystical stone so very special? In ancient times, these green stones were called "The Heart of Spring", and they were considered the symbol of hope and future, of renewal and growth, of justice and harmony. The emerald was given a poetic name: "The Seeker of Love" and "discoverer of truth." It is considered a "rock of happiness" because it is associated with a heart chakra (Anahata). 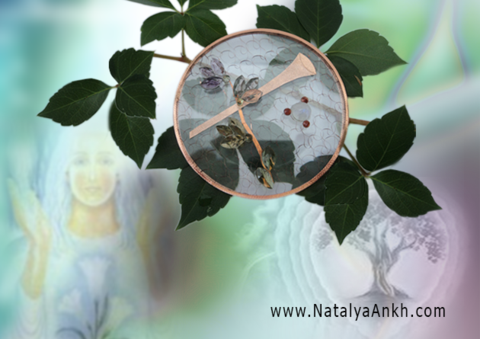 It’s comforting energy is healing on all levels, bringing with it brilliance and joy. It gives inspiration and infinite patience, embodying compassion and unconditional love. The Emerald fosters friendships, maintains a balance between friends. It is known for its ability to strengthen marriage, family happiness and fidelity. In ancient Rome, it was devoted to the goddess of the love and beauty Goddess Venus and it was believed that the Emerald assisted in finding one’s significant other. The Emerald is a stone of true vision and intuition and is linked to eyes and vision. For a long time, it was believed that it could predict future events and allows one to know the truth. It is the rock of wisdom, memory, and increased mental clarity. It combines intelligence with wisdom and brings into consciousness that which is stored in one’s subconsciousness. The Emerald also enhances psychic powers and opens the gift of clairvoyance. This magnificent green rock has been a subject of admiration in many cultures for more than six thousand years. There is evidence that it was sold in the markets of Babylon 4,000 years BC. The emerald was worshipped by ancient Incas and Chaldeans, and Phoenicians devoted it to Ishtar goddess of fertility and love. Emerald was revered in all the major religions for spiritual strength and beauty. In Ancient Egypt, the emerald was considered a symbol of eternal life, the gift of Toth, God of wisdom, it was a beloved jewel of the Queen Cleopatra. The emerald mines in Upper Egypt are among the oldest in the world, and they have been named the mines of Celpatra due to her love for the stone. The emeralds were the talismans of Aristotle, Alexander the Great, Mughals in India. Emeralds were used to decorate the crowns and royal jewels in many parts of the world for centuries. And nowadays these precious stones continue to be of great value, they are a subject of pride to collectors, and they can be seen in the admirable exquisite decorations of the rich and the famous. It is a sacred stone of the Goddess Venus, helping to find and preserve love. It is said that wearing it will help your beloved to remain faithful. Emerald’s vibrations are like vibrations of love, and the emerald can become a bridge between two loving people. It is said that giving this stone to a beloved will keep them in your life forever, but only if your gift is made with a feeling of pure and genuine love. To attract romantic love, the emeralds are worn near the heart. Perfect for the renewal of passion. It is said that the Emerald helps to renew ones relationship with a significant other. To do so, take the emerald, and keep it close to your lips, say the words that express your feelings for your love. Then give the stone to the person you want to renew the relationship with. The emerald promotes self-esteem, especially for young girls and adolescents. It has a calming effect on the emotions that invigorating the mind. It is a wonderful crystal to stimulate artistic creativity and to draw attention to its creations. Emerald is also known to support work, stimulates mental activity, strengthens memory, and gives inspiring eloquence to speeches. If you need to quickly memorize a lot of facts or learn new information, do it by holding the emerald in your hands. It creates a calming effect, promotes mental and emotional equilibrium, making it extremely useful for the establishment of cooperation and mutual understanding in the collective. Ideally suited to people in occupations where visionary illumination is a significant advantage. It's good to wear it for business success. Emeralds are believed to help in legal matters and litigation. It is also a stone of fortunetellers and prophets, helping them to penetrate into the future. In some cultures, it was used in ancient times to make it rain. The most active time of the Emerald is in springtime, that is when it’s strength increases. During the full moon the emerald is at it’s strongest. Assists in the treatment of fever, inflammation, liver disease, diabetes. may be useful against epilepsy, skin diseases (eczema, rash and skin irritation). Has a beneficial effect on the heart and the immune system. It was thought that if you just look at the stone before you sleep, it prevents insomnia. Emeralds are thought to have anti-aging properties, it is well suited to combat age related changes. Having this stone in the house helps to relieve fatigue and regain youthful cheerfulness. It is considered to be the best among the stones to treat the eye and to restore sight. Contemplating on this beautiful green stone helps to relax your eyes. Eye wash with emerald water soothes the eyes and decreases inflammation. To make this eyewash, the emerald is left overnight in a container of pure spring water and can be used the next day as an eyewash. Used to assist in healing heart disease. It is a strong healer of the physical heart, and may be useful in treating the lungs, liver, gall bladder, pancreas and kidneys, as well as the spine and muscle system. It aids recovery after infectious illness, and its powerful green ray can assist healing of malignant conditions. 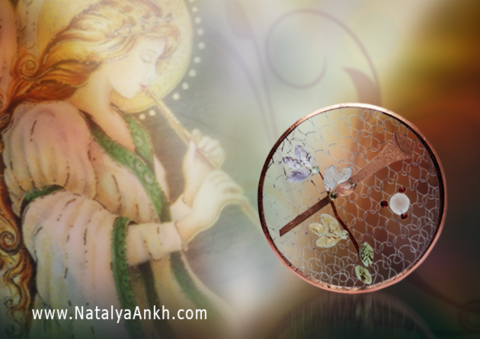 Emerald is a very powerful healing stone and that is why I was guided to use it in my world famous Archangel Raphael Disc. 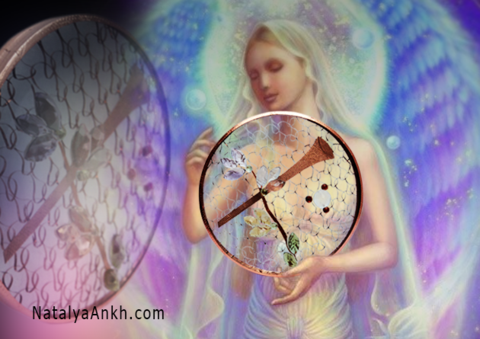 AA Raphael has come to me himself and given me directions on bringing forth a healing disc that would assist many in not only opening their heart charkas, not only connecting to AA Raphael but for overall healing and balancing. Citrine is a stone with a variety of healing and magical properties. A long time ago, it was believed that a ring with Citrine would guard against nightmares, the bad thoughts, calm the wearer down and improve dreaming. In ancient India, Citrine was considered as a mineral with projective energy of Yang. Yogis used it to treat intestinal diseases and stimulate the solar plexus. These qualities are only present in pure crystals without any inclusion. Modern alternative medicine therapists recommend wearing ornaments with Citrine to help with gastritis, cystitis, pyelonephritis. The stone reactivates the brain and accumulates vital energy. Citrine creates a powerful aura around the body that will protect against external adverse effects. You can use it to treat headaches. Also, the Citrine mascots will help children with speech defects. Thanks to the positive energy of good luck and good spirits, the Citrine stone is endowed with the property to promote the normalization of friendly and kinship ties. The amulet will make the person more charming, eloquent and persuasive, and help with communication. Even in ancient Rome, the crystals of Citrine were worn by speakers and senators, thinking they were developing eloquence. It is believed that the Citrine has a property to influence the area of the solar plexus-the centre of the balance of life forces. The Crystal Citrine, with its natural energy, improves the psychophysical state of the body, raises the mood, tones, activates the mental activity, helps to overcome depression and chronic fatigue. The therapeutic action of Citrine also affects people with speech defects. The science of color claims that yellow is conducive to financial well-being, and success. The closer the shade of the Stone to the golden, the brighter the tone of the stone, the stronger it attracts wealth. Citrine, because of their natural sunlight, is perfect for business people, helping to make profitable deals, invest money, and earn income even in hopeless operations. Gambling with Citrine will increase the chance of success in risky situations, and in the event of a loss, it won't lose the mental balance. This gemstone is helpful to those in the creative arts, helps to inspire new ideas, strength to implement various projects, and, at the same time, helping to ensure that these projects yield positive results to the wearer of citrine. Citrine does not accumulate negativity and does not need any energy cleansing, which is very valuable. Smokey Quartz also known as Morion is the stone of the ancients. It is said that Pharaoh Tutankhamun wore sunglasses made from thin layers of Smokey Quartz. And the alchemists of medieval times used it to search for a philosophical stone that would turn any unprecious metal into gold. The name of the stone is of Greek origin from "Morysso"-black. Morion is a dark brown or black quartz with a glass glow. The stone is so rare because of the radiation that affects it. The mineral protects the body and soul of its owner. Jewelry with smokey quartz helps to eliminate any accumulated negative energy. Smokey Quartz transmutes all negative energy, that is directed at the wearer of the stone as well as the one that comes from the wearer into positive pristine energy. This black crystal, helps people achieve their personal and business goals. Smokey Quartz is often used as an amulet of a desire that helps dreams become reality. The black morion, brings abundance and prosperity, but only if people are determined to be positive and not to pursue selfish needs. The crystal helps improve organizational skills. Smokey Quartz helps to inspire creativity. In addition, the Black Crystal helps its owner to prioritize life's priorities by bringing wisdom in domestic matters. The emotional stone of Smokey Quartz raises the mood, helps to overcome negative emotions, and to alleviate depressive symptoms. The properties of Smokey Quartz relieve people of stress, imagined fears, jealousy, anger, and such negative emotional manifestations, converting them into positive energy. The mineral morion can strengthen human spiritual forces and help people to calm down. Wearing ornaments with smokey quartz is recommended to people who have lost close relatives, thus disregarding negative thoughts. Smokey Quartz can help people leave all the negative in the past to focus on the future.